Aaron and I watched Abe and Breanne walk into school together this morning while Ali sat contentedly in the jogging stroller. Aaron commented on how quickly they’ve grown and what awesome kids they are and I had to agree! This list make me smile. I love his logic and requests. He really enjoys reading the Diary of a Wimpy Kid books and owns all but two of them. He recognizes that only Dad could handle managing $10 million and he would be happy with just $30. I asked him why he wants a 2-story house and he said because he likes stairs. Sliding down them, stepping up them, he just likes stairs. The new brother request has been going on for over a year now and Aaron and I have both told him it is a potential possibility but certainly not before Christmas and there is no way to guarantee a new baby would be a brother, so he’d have to get used to the idea of a potential sister also. Breanne is in kindergarten and is a friendly, loving girl. She is making lots of new friends and loves to give hugs to her friends and family. She works hard in school and is reading and writing quite well. She has a TON of energy and is giggly and happy. 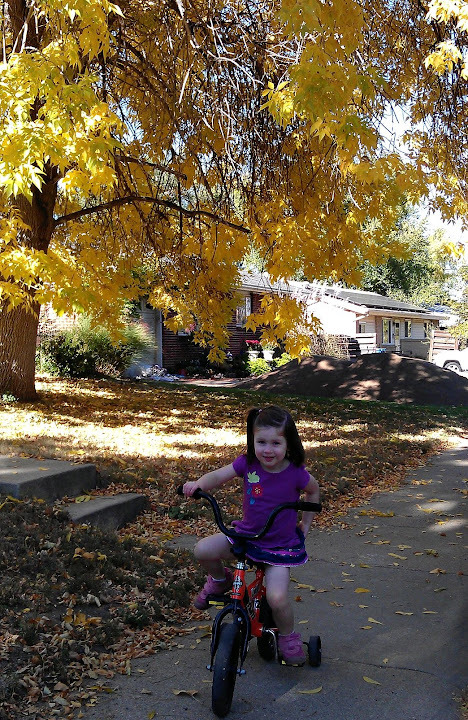 She is fast on her bike, strong in gymnastics, and loves to run and play. She is the perfect middle child and plays well with Abe and Ali. A few weeks ago we watched “The Sound of Music” as a family and after the movie was over she went upstairs and started figuring out how to play “Do-Re-Mi” on the piano. She loves to make music and seems to have a dance beat going on in her body all the time. She is tender-hearted and wants to help others feel loved. She loves to dress pretty and accessorize her outfits. She seems to have clicked with a group of Kindergarten boys and says she plays pretend with the same four boys at recess every day. Reminds me of myself at that age! Ali is getting more creative and independent every day. She just has to be included in the older kids activities and is nurtured and led along by Abe. She follows her siblings everywhere and loves to ride her bike to school to pick them up at the end of the day. She often pretends to be a baby kitten and cuddles up on my lap to read books. At the current moment she is pretending to be my “pet” while she throws blankets and then folds them back up. Three years old is such a fun and creative age! She is adventurous and excited about life and enjoys going to gymnastics and swimming. They’re all growing up so fast!! « Hiking, sledding, trampoline jumping…a snapshot of our past couple of months. What a wonderful update on the kids. I love your family. You are such an example to us. Thanksgiving will be fun…and…crazy! See you soon! I noticed the article in the Running Times magazine a few months back and have been meaning to google you and find out more information. I was so interested to read the article when it showed that you were a mom, but was even more pleased to find that you are LDS. I too am LDS and though no where fast as you, am a running mother. None of my running friends are LDS and think that it’s weird that I don’t run/race on Sundays, but they have been supportive. I told them about you and they thought you were amazing. When I googled your name and found your blog, I was also very pleased to see that you too are a homebirth-er (if that’s a word). Way to go!! I’ll be cheering for you. This is a sweet post. I love you guys and your family. Camp was so fun but we missed you! Can’t wait to meet your new baby!!! You have the cutest kids!